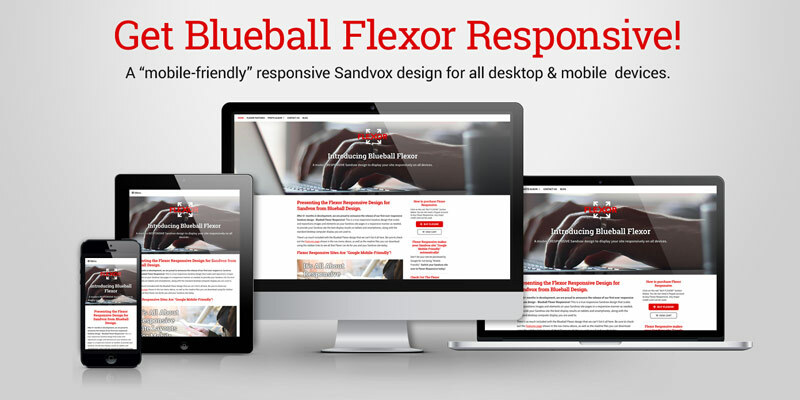 Introducing Blueball Flexor - A Mobile-Friendly Responsive Design! After many months in development, I am proud to announce the release of my first true responsive Sandvox design - Blueball Flexor! Flexor is a responsive Sandvox design that's also Google Mobile-Friendly (check it out for yourself by copying the Flexor demo site link below and try it on Google's mobile-friendly test site). Flexor offers a true responsive Sandvox design layout that scales images and repositions page elements on your Sandvox site pages in a responsive manner as needed, to provide your Sandvox site the best display results on tablets and smartphones, along with the standard desktop browser display you are used to. I highly recommend you look through the two Blueball Flexor user guide pdf files that come with Blueball Flexor by clicking on the links in the sidebar. Also check out all 9 Blueball Flexor demo sites to see the different color versions offered with unique banners in each of them. If you have any questions about our new Blueball Flexor designs bundle, please let me know. I will be happy to help you out. BE SURE to look through the readme files! And to get helpful tips and tricks on working with the Flexor designs and new custom banner images, sign up for our new monthly newsletter on any demo site's home page! I hope Blueball Flexor Responsive helps Sandvox users out. Make your site Google "mobile-friendly" today with the Blueball Flexor Responsive designs! Looking good, mate. Can you just clarify? 1) We cannot put our own picture in the header -- yes? 2) Or change the size of the header -- yes? 3) What about slide shows? Can we still do them? Question #1 - Sure you can add your own custom banner images into the banner image area in Flexor. You just have to do it differently than you would with a normal non-responsive traditional Sandvox design as noted on pages 7 to 10 in the customizing_flexor_responsive_v1.pdf user guide. The Flexor Responsive design uses and displays 3 separate images for each banner image to display on various devices. This allows a different sized banner image to load and display on desktops, tablets and smartphones. For example the smaller sized of the 3 banner images is loaded and displayed on smartphones instead of loading the much larger desktop sized images. This allows for dramatically reduced page load times on smartphones. Because 3 different images are used for each banner image, you cannot use Sandvox's built-in custom banner image function which only allows for one banner image to be inserted. I go to great lengths to detail how to add your own custom banner image in the readme file, and if any Sandvox user has trouble doing it, I will be happy to help them out on it. Question #2 - Like virtually all traditional non-responsive Sandvox designs, The Flexor banner image size is fixed and cannot be altered in the Flexor design layout. The banner image uses the CSS cover property to ensure that the banner image displays and covers the entire background area of the title div area. The width is always 100%. Each different sized Flexor banner image uses a defined height on it based on the device the banner image is being viewed on along with set media query widths to determine which banner image is loaded and displayed. The 3 listed banner image sizes in the user guide files were determined to provide the best display results on a variety of devices across the board. You can hide the banner image area though on any site page, by using a bit of custom css code with Page Code Injection as detailed in the customizing_flexor_responsive_v1.pdf user guide. For example you might hide the banner image on a single image page that is displayed after clicking on an album's thumbnail image, to put more focus on the single larger image. Hope this answers your questions and helps you out. Email me with any more questions or if you need help with anything else on Flexor Responsive. On the Slide Show - yes, I got that when I checked through the photo album on the demo site again just now. I missed it earlier because it was concealed in the photo album. Actually, i had never thought before of putting a slide show in a photo album. Cunning stuff. I'll do that with a couple of my sites. Okay, I misunderstood about the header; in the User Guide, which I downloaded and read right through (!) I was confused by the references to not being able to use the Sandvox banner image replacement method. I have now downloaded and read right through the customizing guide. Since the depth of the header is specified in the CSS, can we change that through site code injection(s) or…? The depth of the header in the demo site is about twice what would like. Obviously, changing the header depth would have consequences in respect of the headline and tag line. I note that we can eliminate the header on individual pages. Good. NOW -- more Flexor designs. You have some excellent designs out there, some of which I am using. Will you be upgrading those to Flexor specs? Yes, I am happy t pay a price for that -- heaven knows, the packages were not expensive in the first place! The Pro Tabs designs would be my first priority. The depth of the Title div header would have to be adjusted for the desktop, tablet breakpoint width, and smartphone breakpoint width css code. But note that by adjusting the height of the Title div, i.e. the header, you could also affect the logo, title and tagline display. Those items could be cutoff and not displayed correctly on tablets and smartphones quite easily if you are not careful. I had a support request that is causing me to update the customizing guide readme file for new css code to hide the Title area on all page types in Sandvox. I had to workaround a lot of the preset current Sandvox design structure and sdk limitations to get a responsive design layout to work. I do have several more responsive designs will underway now with another scheduled for a mid to late April release. Whether I can rework existing design layouts to become responsive is something I will look at, but I am not sure if that's even possible to do to be honest. I will post more on that as I look into it. - Updates the Hide Title div area css code to work on all Sandvox page types. The new readme pdf file is available for download from any of the Flexor Responsive demo sites. Thanks also for the positive comments I have received so far on the Flexor Responsive design. Very much appreciated! Thanks for that, Charlie. As you know, I have bought. I have a number of client sites in Blueball designs; I am planning to update them progressively as your new responsive designs come out (I must have some variety in the "look"). In the meantime, I am updating two of my own sites, rabaulpng.com and newireland.info, which are hubs for my clients and incorporate links to them, in the new Flexor designs as an interim measure. That should keep me and my clients on the mobile map. Thanks for doing the work -- and making it available as such a cheap rate!!! Thanks for the kind comments on Flexor Geoff. Much appreciated! I have been getting in support requests asking about adding in custom banner images to Flexor and how to create them. Seems a lot of Sandvox users are not very familiar with using image editing programs in general for banner images, so I thought I would recommend one we use here that is very easy to get up to speed on and create banner images with. I have no affiliation with the company or developer that creates Acorn, but just like using the program. I have gradually switched over to Acorn and Pixelmator here this past year to the point that I have stopped using Photoshop now for my image work. I hope this helps everyone out on creating their new custom banner images for Flexor. Heh, heh -- I use PhotoLine -- 30 day fully functional trial, incredible capabilities (far beyond mine! ), amazing economy of code, download is only about 40 MB which expands to 70 MB, yet it can either match or outperform Photoshop on many parameters. Further, it is at v.18.5 so you know it has been around for a while, you get support directly from the two brothers who build it, and it costs < $100. In addition to excellent image editing/generation tools in your choice of 32 or 64 bit, it has some good vector and type tools (using OS X's type engine) too. The downside is that the brothers are engineers, they are German, and the Help and manual are not as good as they could be (e.g. they never talk about "images", they talk about "layers" -- but it is not really hard to get used to that). On the upside, there is a lively user forum with expert users always ready to help and we users are gradually persuading the bothers to use some familiar terms instead of purist engineering terms. www.pl32.com (they named the site back in the day when 32 bit was special! ). Have a look at the forum too. […] I have no affiliation with the company or developer that creates Acorn, but just like using the program. I have gradually switched over to Acorn and Pixelmator here this past year to the point that I have stopped using Photoshop now for my image work. may i ask you, why you stopped using Photoshop? Because of CC? Beside this i would recommend Pixelmator or Acorn, too. Especially for this kind of image work and for beginners. And a really good price for such an application. I have used Photoshop since v1.5 I believe (maybe an earlier 1. something version), and watched it evolve from a great program I used on a daily basis in my design business back then for high end advertising, brochure, catalogs, posters, etc. to the featured bloated program it has become now that is overkill for my current image and design needs. When they changed to their subscription pricing that is very expensive for a small business to pay, I looked at other options that were available, and between Pixelmator and Acorn, I have 100% of my image editing needs covered now. Both programs are VERY fast when compared to Photoshop's performance, and overall are much more intuitive to use. And with Affinity Photo coming out very soon (in beta now) that is a true Photoshop killer, I see no reason to continue with Photoshop (or Illustrator). That's why I stopped using it and switched over. Wow PhotoLine. That is old school Geoff! PhotoLine was originally a PC program that was ported over to the Mac back in the late 90s I believe or early 2000s? (not sure on the exact date). You can tell this by looking at the user interface which is definitely geared towards PC users back in the late 90s. The UI is very similar to Graphic Converter's old late 90s UI layout. Nothing against either of these programs as both are excellent programs to use for image editing, but new users would get completely lost using them in my opinion. That's why I suggested the programs I did and recommended Acorn for new users as it is very easy to get up to speed with and Acorn's modern UI is a pleasure to work with. Thanks for the comments and feedback guys. Interesting discussion revisiting other program options. True, Charlie, PhotoLine is old school -- the version numbers tell you that -- and the UI is a touch old fashioned, and it was originally a Windows program but it now is not it is equally valid on both platforms, as the fact that it now uses OS X's text editing tells you. It works 100%. Interestingly, I am not sure real new users would find it confusing -- those who do find it confusing, as I did at first myself, are people who are switching from other programs such as Photoshop, and that is really only because of the nomenclature. Once you stop trying to force PS names on stuff, and just accept the notion that your base image is a layer, for example, everything smooths out. In addition, as I said, we users have persuaded them to make some improvements to the interface, including nomenclature. …it is coming back to Mac!!! Very soon! This (northern) Spring! All brand new code, Mac dedicated. Good grief -- I might be forced to downgrade my OS to whatever is current. Firstly, thanks for the all the effort you are putting into creating a mobile-friendly Sandvox template design. I am looking for a template to make my sites more more-mobile friendly. I have had a look at a few Flexor sample sites and was wondering if there are any others that I can be referred to that are up and running. I have seen Geoff's sites and they look great. I trying to gauge the functionality of the template to meet my needs and the range of other sites that may be closer to the layout I'm looking for . I have had a look at the Flexor Blue demo link and it looks great on my desktop. Sadly though on my Android Samsung Galaxy Note 3 in 'Portrait' orientation, the white text "A modern RESPONSIVE Sandvox design...." leaves the image area foreground and moves down into the white space and is over the top of the blue text "Presenting the Flexor Responsive Design......." text. If there was a way to attach an image to show what I mean I could post it. Unfortunately it's not a good look. In 'Landscape' orientation it is great. For your info, I am using Samsung's default Internet browser. In Google Chrome for Android, it looks great in both orientations. Obviously the site's/template's responsiveness depends on the browser being used. To be honest we did not test the responsiveness of our Flexor demo sites in Samsung's default browser on the Galaxy Note 3. We just tested Google Chrome on it. On other smartphone models we tested with the default Android browser, Chrome, Safari, and IE on a Windows smartphone. That said, depending on the screen width, you may or may not have to adjust either the sizing of the title and tagline text some so it will display as expected on the Samsung default browser in portrait mode or go with less text. I am assuming it is just one line of text that is displaying outside the banner image in Portrait mode in the Samsung default browser? If you want to email me and include a screen cap of what you are seeing if possible, I will be happy to help you out on any issue you might be having with your Flexor design site setup. I sent you a dropbox link to a screenshot of the issue via your Flexor page's contact page. I haven't purchased Flexor yet, I'm just evaluating its performance and capacity to meet my layout needs. Are you able to provide urls of different websites using the Flexor template? I have seen Geoff's sites. Thanks for the email and image. I have replied to you on it. Flexor just came out this past Saturday and while I have seen several nice sites that are being created with Flexor this week, most of them have not gone live yet. They should be soon and hopefully folks will post about them or add them to the sandvoxsites.com site for everyone to see. I only found this thread after I wrote you for support on Flexor. I think you've answered my main question here, i.e. it's not currently possible to change the height of the banner relative to the width, which is a shame. Seems I'm not alone in feeling that these giant title cards don't really work for me. Trying to figure out a way of making the layout work without it, meanwhile. By the way, I don't know whether this is a Sandvox bug or an issue with the design, but I've noticed that images don't stay the correct size while working in Sandvox; I have to upload the changes & preview online to see what the layout actually looks like. Any feedback on that would be appreciated. PS: This might have something to do with what you explain about the limitations to image size in your help file. When I'm more awake I'll try to revisit that. PPS: Yeah, so I'm probably not doing it "correctly;" I ought to go and pre-scale the images to the max. pixel dimensions required. But the point seems to be that it DOES work, what I'm doing (what doesn't work, i.e. scale on a mobile display, is the Youtube plug-in; I'll bother with it when I have time) it just doesn't show up correctly in Sandvox. Developers will probably scream at me for engendering horrible code, but this is how a non-techie works on his layout, which is after all who Sandvox was meant to be for, no? I only found this thread after I wrote you for support on Flexor. I think you've answered my main question here, i.e. it's not currently possible to change the height of the banner relative to the width, which is a shame. Seems I'm not alone in feeling that these giant title cards don't really work for me. Hi Goesta. If you are not using the logo, title and tagline options in your Title header area then you can definitely change the height of your banner image using some custom css code. Very simple to do. If you are using the logo, title and tagline in your page layout, then no you cannot change the height of the banner image. By the way, I don't know whether this is a Sandvox bug or an issue with the design, but I've noticed that images don't stay the correct size while working in Sandvox; I have to upload the changes & preview online to see what the layout actually looks like. Any feedback on that would be appreciated. Let me see if I can explain this better to help everyone understand this question about images in the Flexor design responsive layout. For this example I will talk about using an image that has an original image size of 1000px wide by 600px tall. You have originally re-sized this image down to fit in your page's content area on your old site using the non-responsive fixed width design by using the width and height controls in the Metrics window in the Inspector. The size you ended up using was 500px wide by 300px tall. By doing this you are relying on Sandvox itself to resize the image down at export or publishing to force the image to display at the 500px wide by 300px height size on your site page. When you do this, Sandvox adds a set fixed width and height setting to that image in your site. In this case Sandvox sets a width of 500px and a height of 300px on the image. By doing this your image automatically becomes non-responsive, i.e. the image will not resize and scale down for mobile devices and their narrow width screens. The image will always stay at that fixed width and height applied by Sandvox to the image. In the Flexor design there is a bit of custom js that automatically removes any fixed width and height amounts and replaces them with max-width: 100%; and height: auto;. This makes any image become responsive and allows the image to scale down automatically as needed for display in full on narrower mobile device screens. BUT by doing this, any image that has been scaled down using Sandvox's Metrics controls automatically reverts to the original 100% image size. In this example, the image reverts to its original 1000px wide by 500px tall size on the site page it is used on. Hope that answers your questions and betters explains how to work with your site page images using the Blueball Flexor Responsive design. I need to amend my last post to answer some questions that have come in. Note that the large images added to each of these items and the slideshow will be displayed the full width of the content area by default so make sure your original images are large enough to span the width of your content area. Sorry for any confusion my last post may have caused you on this matter. Thanks for those who have emailed me about this too. Hi Charlie and thanks so much for the explanations! Thanks, Charlie. I was about to email you with questions on these very matters. Charlie, I just want to say you've saved my Sandvox skin by a whisker ... well, to some extent. Here's a message for anyone sitting on the fence about going mobile. After seeking a responsive design for some time from the good people at Karelia, and not receiving much joy, late last year I jumped ship to Rapidweaver 6, where I am building my latest content-driven site. Following Google's announcement that we humble folk need to go "mobile" if we want to retain our rankings, I was planning to undergo a lot of pain by rebuilding my other 4 main sites in RW. This would have taken weeks. So, I'm switching at least 2 of my main SV sites to Flexor. However, I'm hoping that a couple of other responsive design alternatives come out soon so that there's a greater choice. Whether they are from you or other designers doesn't matter. Thanks Charlie for your efforts in bringing us up to the "mobile" mark! Can anyone tell me if you can make the banner into a slideshow for bluebell flexor. Thank you for the tremendous response and positive comments about our Flexor design! I hope you are finding it very helpful in making your sites Google "Mobile-Friendly". - If you use Sandvox's built-in font resizing options to resize your Title and Tagline text, this adds in some inline css styling into your source code for those items. This inline css styling overrides the mobile font sizing set in the Flexor design's main.css file which can cause display issues on smartphones. If you must resize the text in these two items, do so using some custom css code in the Style Sheet window using Site Code Injection instead which doesn't override the default mobile font sizing set in the design's main.css file. - Along with the above item, please remember now that when making a Sandvox site responsive, you also have to consider your site's mobile device display in addition to the standard desktop display you are used to working with in Sandvox. So think about each item you are adding into your site and how it will display on a mobile device too. Anything you add into a page like code from a widget for example, must also be set up to be responsive in behaviour as well or it could impact your mobile layout display in a negative manner. LAST BUT NOT LEAST, I will be releasing another NEW responsive Sandvox design late next week. More details to follow soon on this.